A little over a week ago, my high school friend Cullan married his college sweetheart Jill in Salem, MA. My high school friends are an incredible bunch - all you have to do is flash the bat signal and they are there. In this case, it was for the wedding of one of our own. As soon as we got Cullan's invitations, we were booking flights and figuring out which witch museum we would visit in Salem. Jill is very crafty (she's an architect) and her sense of style infused the entire celebration. She designed many of the details - from the invitations to the mardi gras cups. Here is the story of the weekend in a photo montage. All beverages at the wedding were served out of custom Mardi Gras cups. Jill designed them to look like the Salem skyline. The Bride and Groom make their entrance! My high school friends love taking group photos. Check out how many of us flew in - and these are just the girls! The view - it was such a beautiful day. Dinner time! Lobster rolls - I ate two of them! My high school friends - take 1. My high school friends - take 2! The cake and cake pulls. This little guy was break dancing out on the floor. What a great weekend! Now someone else in our group of friends has to get engaged so we can do it all again. This weekend my parents and two of my four brothers were in town (thus the delinquent blogging). Many more pics to share soon... although this one highlights the milk that was purchased. 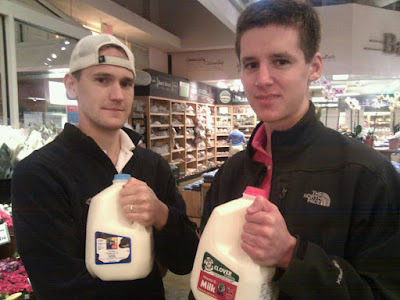 Patrick drinks a gallon of whole milk per day! No wonder he is 6' 4" at 18! We had to make a special trip to get it as we ran out. Milk - does a body good! Check out this massive sandcastle I saw this week! This weekend should be beautiful - perfect for the beach or a hike or a wedding (congrats Graeme and Cary)! Today my parents and my littlest (and tallest) brother came into town. To celebrate their arrival, we all went to a restaurant in San Francisco called Capannina for dinner (including my brother that lives in SF). 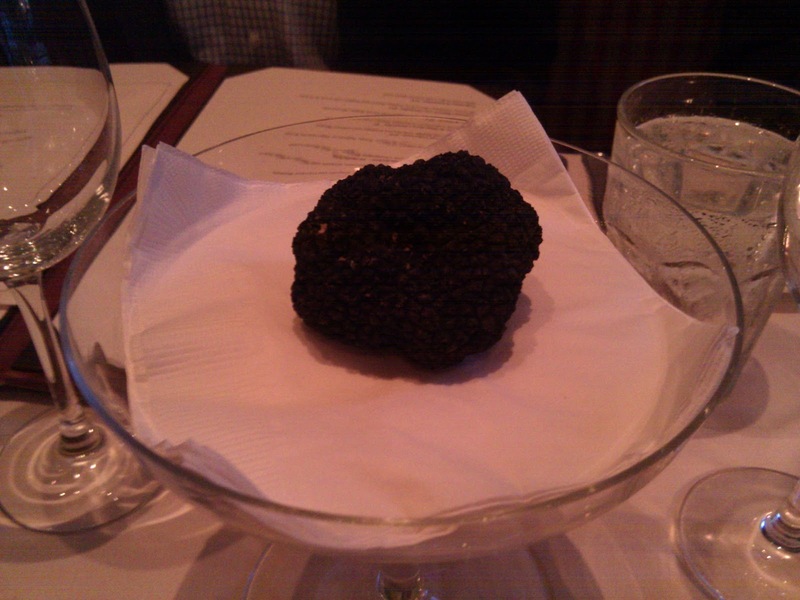 The specials of the day all involved black truffles. 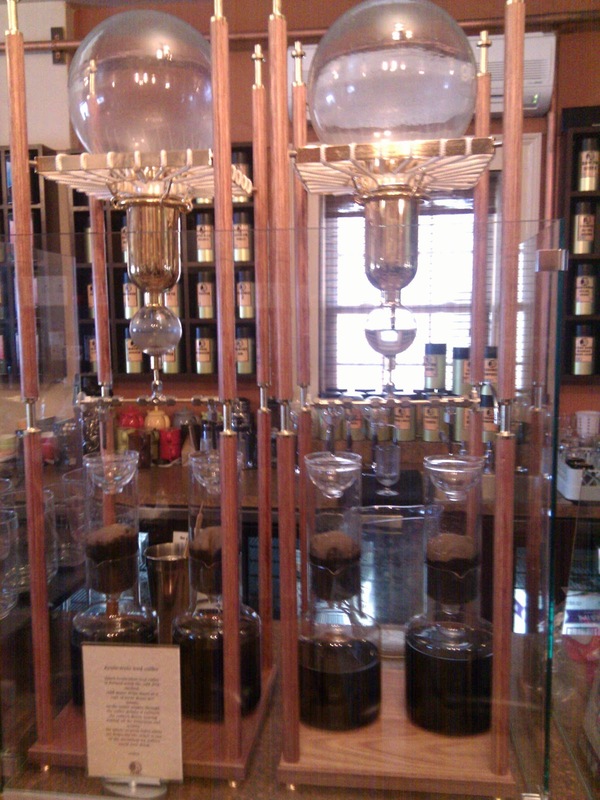 They brought one over for us to look at and smell. I had never seen one before. It was presented on what looked like a cupcake stand. Given that it was the special, I ordered the pasta carbonara with sliced truffle. 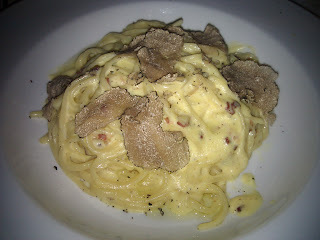 I am pretty sure that this is the first time I have ever had a truffle sliced on food (I have seen truffle oil before). I know that this isn't the most appealing photo - but it was good. The dish had a lot of flavor and it was really fun to try something new. The ambiance for this restaurant was even better than the food. Great waiter, lighting, service, wine - everything. Seems like a very sweet little neighborhood Italian place that would be good for a date. Given that squirrels ate our lettuce plants approximately 10 minutes after we planted them, I didn't have high hopes for the rest of our garden (this is our first year growing food so I thought I would give myself some slack). 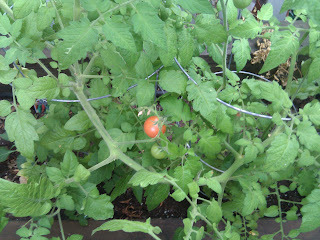 However, I am proud to report that we have baby tomatoes that are alive and healthy! I bought some basil and made pesto pasta to go with roasted cherry tomatoes (inspired by those we had at Amy and Michael's house a few weeks ago) and a butter lettuce salad. Homemade pesto is SUPER easy. I used the Joy of Cooking recipe and all it called for was basil leaves, parmesan cheese, pine nuts, garlic, and olive oil. That's it! 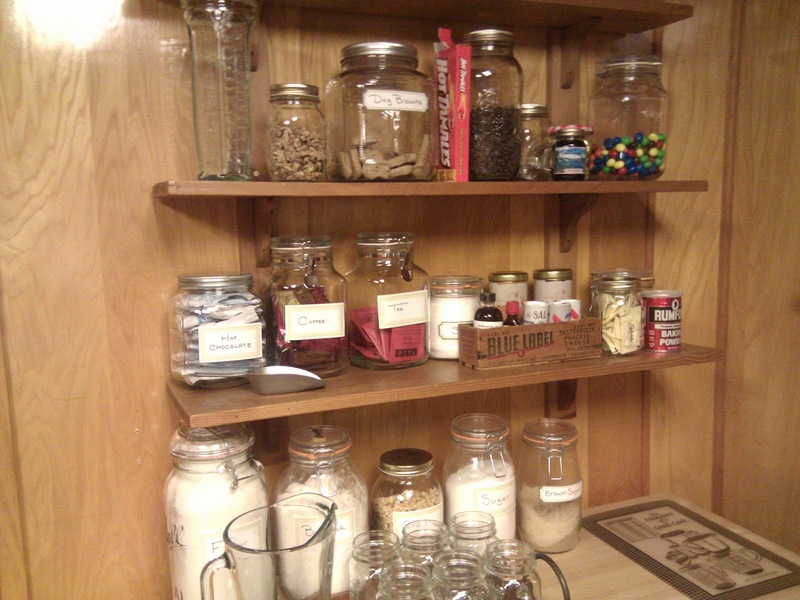 It was part of my new resolution to use what we already have in our pantry. Everything (except the basil) used in this meal was something we already had (or grew). We also had an unexpected expecting visitor - my sister-in-law! It was fun to share a nice (and simple) meal with her and her wee one on-the-way. 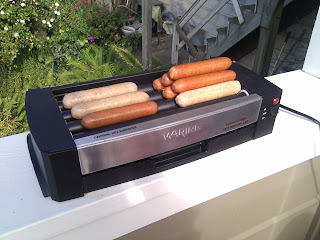 We recently went to a birthday party up in the city that featured a hotdog grilling machine. Think 7-Eleven style. The birthday boy has a brother that works for Hillshire Farm who thought it would be funny to get his brother one of these machines. The ones at convenience stores are very icky (how do they clean them? do they get seasoned like cast iron? ), but this one did a nice job warming them up and didn't have 15 year old grease hanging from the edges. While I find it hard to justify such a specialized piece of equipment, this did get a lot of conversations started... might be something to think about for those in search of the perfect hotdog. This past weekend we spent a quick 36 hours in Salem, MA for the wedding of an old friend from high school (has it really been that long?!). I will share some photos from the trip later in the week, but I thought I would start the week off with a little jolt of caffeine. 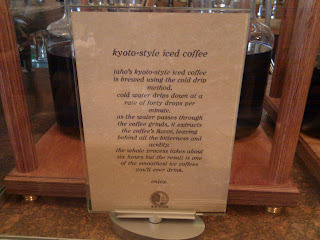 While we were looking for some morning coffee on Saturday, we came across a coffee shop called Jaho in Salem that made coffee with cold water using an Asian drip method. It was so hot out that anything hot was WAY out of the question. Check out this contraption. I also took a close up of the explanation. I was so excited to try something new! Lately I have been scaling back on my caffeine intake (it makes my heart race), but I figured that I would try this special brew. I have to say that I found it really bitter! It kind of tasted like day old coffee unfortunately! I also kind of reminded me of New Orleans coffee with chicory, but even that is better. Philz coffee still holds the record for best coffee ever. No contest. 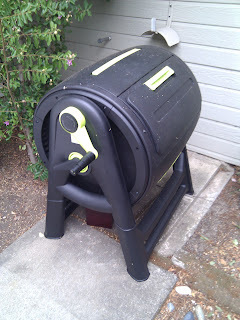 In previous posts I have mentioned our compost bin, but I never got around to photographing it until last weekend. I think that we could have gotten a discount or a voucher from the County of Santa Clara for a composter, which for a long time kept us from getting one because the office's limited hours and forgetfulness on our part. Therefore we finally bit the bullet and laid out $100 for this turning one from Home Depot. With our CSA we eat a lot of veggies and fruits and it had finally become too painful to throw all that food waste in the garbage. So far it has been awesome. We put in food and yard waste and every few days give it a few turns. Since getting the composter (which doesn't smell or attract bugs - well at least not yet), we have generated almost zero trash. Everything is either recycled or composted! It is amazing! We have put almost a month's worth of stuff in there and yet when you look in, it seems almost empty! Where does it all go? Magic. I took an organic farming class in grad school and because there was so much crop waste, we had lots of compost piles. However I like our Garden Views Dynamic Spinning Composter for the home because I don't have to monitor it with a thermometer and use a pitchfork to turn it over. For the fourth of July weekend, my husband and I went to Ashland Oregon with the Santa Monica Luskey's. When they got married two years ago (the same weekend as Kelley so I didn't get to go). As a wedding gift, a dear family friend of Brian's gave the two of them a weekend at their Talent, Oregon summer home. Then, for our wedding gift, the Luskey's shared their Oregon weekend with us! So generous! We had been looking forward to the trip for such a long time when it arrived. I think that it is our first time traveling with another couple. I knew we were off to a good start when I met Jermajesty - their Garmin that they'd named after Jermaine Jackson's kid. 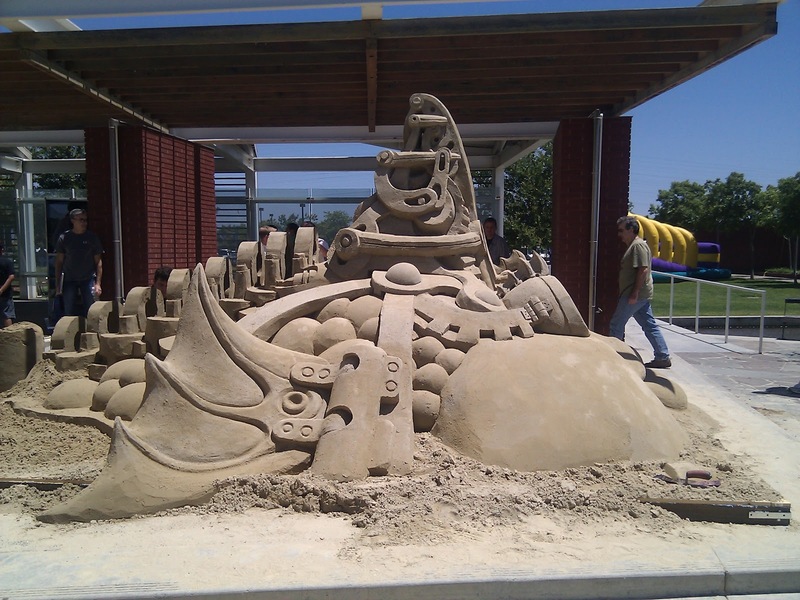 Talent was a particularly attractive location because it is only about 10 minutes from Ashland, OR. Ashland is the home of the Oregon Shakespeare Festival. Dave and Brian had gone to the Shakespeare Festival several times in high school and college and have seen lots of plays, both Shakespeare and other. They had been trying to get back for years, and this year the stars aligned. On Friday night we drove up to this adorable log cabin style house in Talent (only about 10 minutes from Ashland). This is what the house looked like from the backyard. Insane right? Can I dream of a second home before we even have a first home? They also had the coolest chicken coop (not currently in use). The coop was built around a tree and looked really cool. I wonder how it impacts the health of the tree (if it does at all) - more fertilizer, but probably less water. On Saturday we started the day with a behind the scenes tour of the three theaters used by the Oregon Shakespeare Festival (OSF) - including one outdoor Elizabethan theater. I am a sucker for tours with guides, so I loved hearing all about the costumes, lights, set design, wigs, makeup, etc. It was really fun! Then Saturday night we saw Twelfth Night in the Elizabethan theater. It was the 75th anniversary of the OSF so it was a very special weekend to be there (same play, same theater site, same day 75 years later). There was this cute coffee in shop in Ashland that served baby sized ice cream cones for $1 and they were perfect summer treats! On Sunday we caught the matinee of Cat on a Hot Tin Roof. Not all of the plays put on by the OSF are Shakespeare - which was news to me! We saw their last performance of the season, so it was also very special. Sunday night (the 4th) we had a BBQ on the back porch. We ate a lot of queso (let's just say that an entire brick of oddly shelf stable Velveeta disappeared over the course of the night). Here is Kim after we ran out of the first batch. Lots of smiles after the second batch was ready. We made chicken skewers - which of course I dipped in queso. With no wine opener - and no screw top - at one point we had to dig out a cork with various knives. No party would be complete without 2am Bananagrams! We introduced the Luskey's to our favorite game. On Monday we packed up the house to go home. This house was too cute not to document, so I took a few pictures of my favorite spaces. The guest bathroom had a cool clawfoot tub and nice wainscoting. The upstairs bathroom had all kinds of guest supplies in ball jars in baskets. It was really cute. I am going to steal this idea one day. 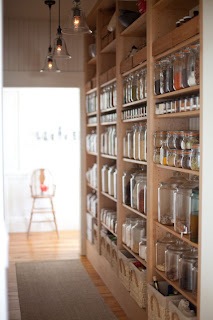 Their kitchen had some exposed shelving with more labeled jars. I loved the way it looked. Many thanks to the Luskey's for including us in such an awesome trip! It was the perfect weekend and so fun to travel with two great friends. Is it too early to start planning next year's trip?! Ashland 2011 here we come! [Update Sunday, July 18]: Check out these shelves from Design Sponge! Kim just sent me the photo. They are a very chic version of the photo above. Turns out this photo is from the kitchen of a woman that I have blogged about before - Emersonmade. Small world. 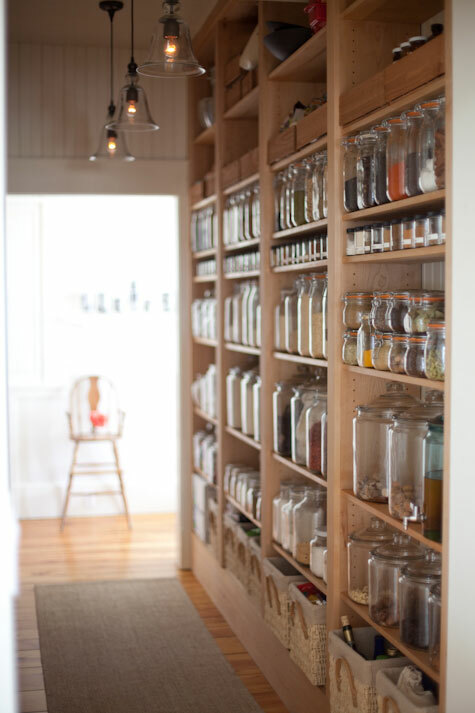 She has great taste (and an amazing pantry)! 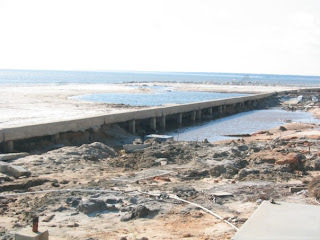 So far on the blog, I haven't said much about Henderson Point, MS. In the 1980's my grandparents bought two condos in a condo complex called Inn by the Sea. I grew up going there most summers for the 4th of July. My family shared it with my dad's other siblings and their families. My grandparents went down every weekend during the summer. 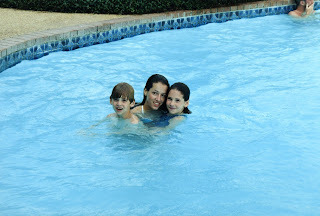 Here I am in high school in the pool with Bridget and Patrick. The Inn by the Sea is a pretty unique place because it is one of the few areas on the entire Mississippi Gulf Coast, that is directly on the beach (without Hwy 90 running between the houses and the beach). It was (and now is again) a U-shaped 4 story building with 72 units around a snowman shaped pool looking towards the Gulf. 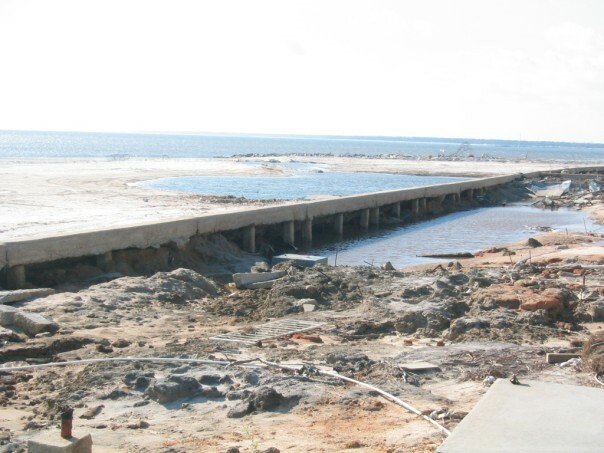 Henderson point is just east of the entrance to Bay St. Louis and close to the Mississippi/Louisiana state line. Amazingly, I found this video that shows what it looked like in April 2005 - 4 months before it would be destroyed in hurricane Katrina. The first building shown in the video (the blue one) was Inn by the Sea. 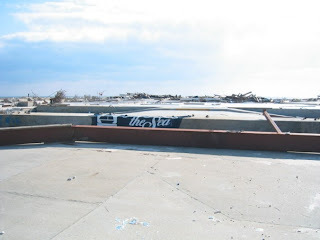 I probably haven't talked about it much because it was completely and totally destroyed by Hurricane Katrina. Nothing was left. Here is a photo I took in November 2005. 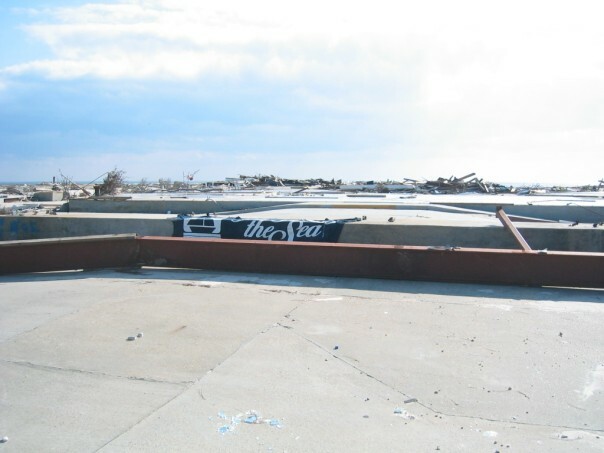 I am standing behind what used to be the building looking toward the ocean. Only the slab foundation is left. Here is the pool from the first photo. When I was standing there, I was thinking where did 72 fridges, couches, beds, stoves, tv's, etc. go? They all washed out into the gulf. Incredible destruction. 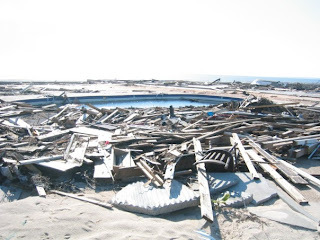 Here is the beach and the sea wall (there used to be dirt, grass and trees on the inside of the sea wall, but the storm just dug everything out). So you can see why, for the past 4.5 years, there really hasn't been much to talk about. I found a video on YouTube that showed what the construction site looked like in June of 2008 (isn't the internet wonderful!). What is particularly sad is at the end of this video you see the Village, the condo complex next door. Today it looks the exact same. Apparently something shady went down and someone got away with some money and the owners were left high and dry. So the Inn by the Sea was rebuilt and earlier this year my extended family again took ownership of the condo (we went from two to one). I got the opportunity to go in June and it was completely amazing. They have changed a few things, but the heart and soul remains the same. The first level is now a parking garage that is open (so if a storm surge hits again it will just flow through), so there are now 5 stories including this parking level. The exterior went from blue siding to tan stucco. The balconies that were once shared are now private. Although all these things have changed, the pool remains the same - swim up bar and all. Check it out. Remember the photo of the sea wall? They filled it back in and it is still there. Doesn't it look so different than in the photos above? Also the beach is back to beautiful. Because my dad and his siblings didn't want to argue about decorations, they hired a professional and this guy did an AMAZING job. I absolutely love it. It looks very beach chic now. Our old condo was awesome too, but a little more rustic and had sort of an 80's vibe (geometric sheets a la Saved by the Bell and and white wall-to-wall carpeting). The updated kitchen with seriously nice appliances. 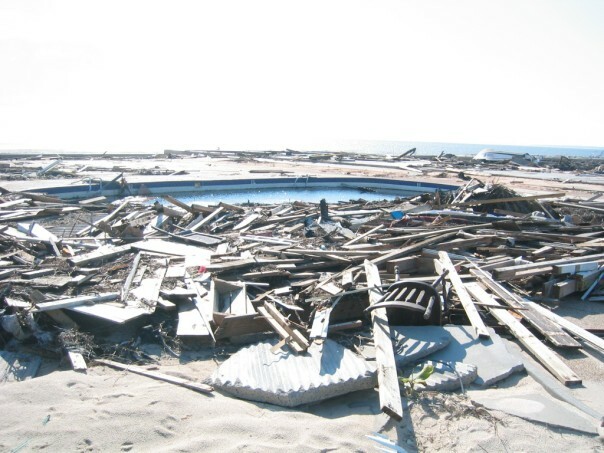 The view form the beach (see the Village skeleton lurking to the right of the photo 5 years later). It has been a long time coming, but I am SO excited to have Mississippi condo open again. My husband has never been and I can't wait to take him to my childhood summer happy place. The water is always warm, the waves are always gentle, and the sand is always soft, white, and warm. I am already plotting how to get back there this summer. The long journey home started on Day 13. We first drove from our dream-come-true hotel Blanket Bay in Glenorchy to the Queenstown airport. From there we flew to Auckland and then onto San Francisco. It was one of those strange things where we landed before we took off (one of the oddities of crossing the date line from west to east). In our state of utter depression caused by returning to the real world, we didn't take many photos on Day 13 (although I did have some delicious shepherd's pie in the Air New Zealand lounge in Auckland that did lift my spirits... that and the excellent movie selection on the long flight to SFO). Therefore, I will leave you with a photo we took on Day 12 of a rainbow. It was quite beautiful. New Zealand was a truly wonderful place populated by friendly, warm people. I hope that in my lifetime I get the chance to go back.